I'll be back later this week with a final post on visiting Marrakesh with a toddler, but I've had Vilnius on my mind lately, so here is a post about Vilnius instead! The ISO household is definitely getting excited for our visit to Vilnius next month! New creativity is springing out of crumbling, cement Soviet structures and blossoming into flavorful cuisine incorporating locally sourced ingredients, historical recipes, and new inventions using homegrown products. Lithuania has seen the recent establishment of surprising culinary and coffee creations, and is one of the best places in Europe for hungry foodies seeking delicious, affordable dining all while recognizing Lithuania’s unique culture. Over the four years I lived in Vilnius—Lithuania’s hip capital city—I witnessed a massive change in dining and creating, with new restaurants popping up that combined Lithuania’s history and natural products with its reinvented persona suited to its entry into the European Union. Vilnius, and the whole country, stole my heart and my stomach, and I’m sure it will do the same for you. When visiting Vilnius, you should expect a plethora of restaurants and cafes, most with menus in English and Lithuanian and some English, Russian, and Lithuanian speaking staff, making it easy to ask questions and place orders. In many cities, you’d likely be warned off dining out in the old town due to high prices and low food quality; however, this absolutely is not the case for the compact city of Vilnius. In fact, some of the best restaurants that Vilnius has to offer can be found tucked down cobblestone side streets and neighboring popular tourist attractions. With a focus on local, wild-harvested foods, Sweet Root has taken local and visiting foodies for a flavorful adventure through Lithuanian forests by simply dining at their table. Sweet Root’s menu changes frequently based upon what’s in season or growing in the restaurant’s greenhouses, but you can expect unique flavor combinations and preparations no matter when you dine. Dinner at Sweet Root is a leisurely affair and can only be enjoyed as a seven-course meal spread over three hours. During this amazing meal, you might get to try dishes such as northern pike with cucumbers and gooseberries; broccoli, cauliflower, and pears; ox cheek with beetroot and onions; and black currants, puff pastry, and caramel. More than delicious flavors, the food is plated exquisitely, providing a very high-end dining experience. Vegetarian and vegan diners can also be accommodated with at two and five days’ notice, respectively. Sweet Root is definitely a restaurant to reserve your space ahead of time. Located in a historic 16th century cellar facing the Vilnius City Hall, Saula Food Cellar welcomes diners with its cozy interior designed with exposed brick walls, splashes of bright blue, and traditional symbols. The menu changes based on what’s in season and ingredients are sourced from local farmers. Their cuisine elevates traditional Lithuanian food, which typically incorporates lots of root vegetables, milk products, pickled vegetables, and meat, by presenting and cooking it with modern techniques. I’ve eaten the melt in your mouth beef cheek with roasted root vegetables and mashed potatoes—all of which was perfectly done. The staff here are friendly and even wear uniforms made by a Lithuanian designer to further pay homage to Lithuania’s heritage and illustrate its thriving crafting tradition. Another amazing restaurant in which visitors can learn about Lithuanian cuisine and culture is Ertlio Namas. 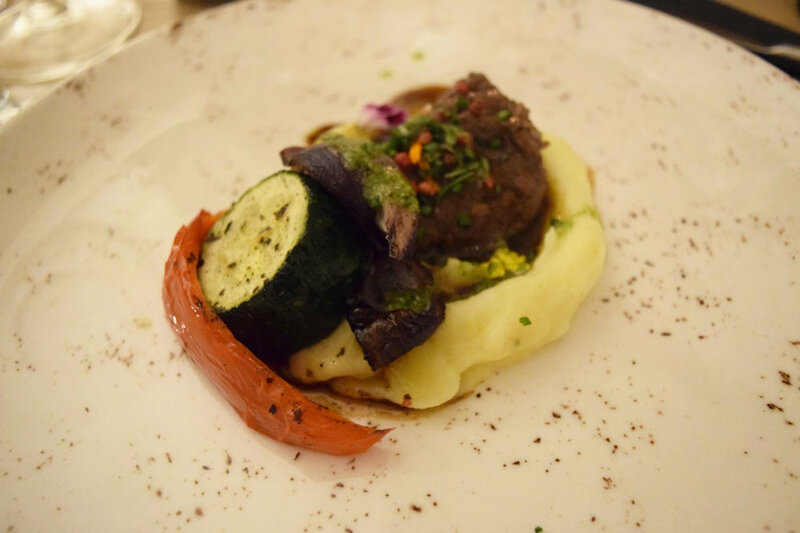 Located just off the busy Pilies gatve near Vilnius University, Ertlio Namas serves both four course and six course tasting menus using local ingredients and Lithuanian recipes dating back to as early as the 14th century. Examples of what you may eat based on the season are zander with parsnips; baked partridge with chestnuts; beef with honey cakes; and brown bread pudding with sea buckthorn. The dishes created from these ancient recipes are served in a 17th century historic building that was built by Jurgis Ertlis—hence the restaurant name, Ertlis’ House—who was a master stonemason and carpenter. A visit to Lithuania would be incomplete without a stop at one of its plentiful, unique cafes. One that stands out from the crowds of hip cafes is Crooked Nose and Coffee Stories, which is a minimalist’s dream come true. Now, coffee is definitely not a local product of Lithuania and neither are the brewing techniques, but Crooked Nose has created a unique brewing device—called BRO—made from local wood and linen. If you use a BRO and coffee beans roasted by Crooked Nose, you’ll be savoring the developing coffee culture that is occurring across Lithuania. We're visiting Vilnius again next month and I can't wait to share more about the shops and eateries I'm most looking forward to including a few exciting new openings!